Areas of Interest: Sarah has a passion for Sports Medicine Rehabilitation, specializing in treating the runner, swimmer, triathlete, football, and basketball player. 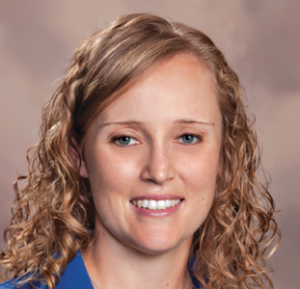 Sarah also is a Vestibular and Concussion Rehabilitation expert. Sarah is energetic, engaged, and caring. She has a restorative strength where she enjoys the challenge of analyzing the symptoms, identifying what is wrong, and finding the solution. She lives in Williamsburg with her husband and step son. She enjoys distance running and leading an active lifestyle, attending high school and college football games, and spending time outdoors with her friends and family.